A couple of Harbor Freight digital calipers and a long-lasting SR44 battery. The top one costs a little more but it can also display fractions. More importantly, it has a bigger and brighter LCD display and it works a little smoother. Shortly after I started MachinistBlog I wrote about a couple of good web sites that can teach you how to read a micrometer. That post has been surprising popular. So now I want to tell you about this excellent web page that might teach you some things about using a digital caliper that you don’t know. Unfortunately, my budget hasn’t allowed me to invest in a nice $145 Mitutoyo digital caliper like the one shown in the tutorial. I’m still using Harbor Freight digital calipers that you can buy on sale for about $20 or less. My first was HF’s least expensive 6-inch stainless steel digital caliper, which I think you can still find on sale occasionally for about $10. It still works well, although I did manage to break the tab that holds the battery cover on. Black electrical tape now does that job. About a year later I bought a slightly more expensive 6-inch HF digital caliper that could also display in fractions of an inch. I found that feature to be pretty useless but its slide works much smoother and I really like its bigger LCD display. I haven’t seen this caliper (#98851) in my local Harbor Freight store in a while and it also recently disappeared from their web site where it used to sell for about $25. I’ve been using mine for about 3 years now without any problems, although it doesn’t get the amount of use a professional machinist would give it. I have verified its accuracy with a very good set of gage blocks, although I haven’t done it in awhile. I didn’t know this until just now, when I was looking at HF’s web site, but their digital calipers have a lifetime warranty. The battery in the Mitutoyo caliper is supposed to last at least 3.5 years. The batteries in Harbor Freight calipers seem to last somewhere between 2 months and a year. Many don’t seem to know this, but you can use either LR44 or SR44 batteries in them. They come with LR44s, probably because they’re cheap. You can sometimes buy 10 for a $1, but they don’t last very long because they have a lower voltage output. 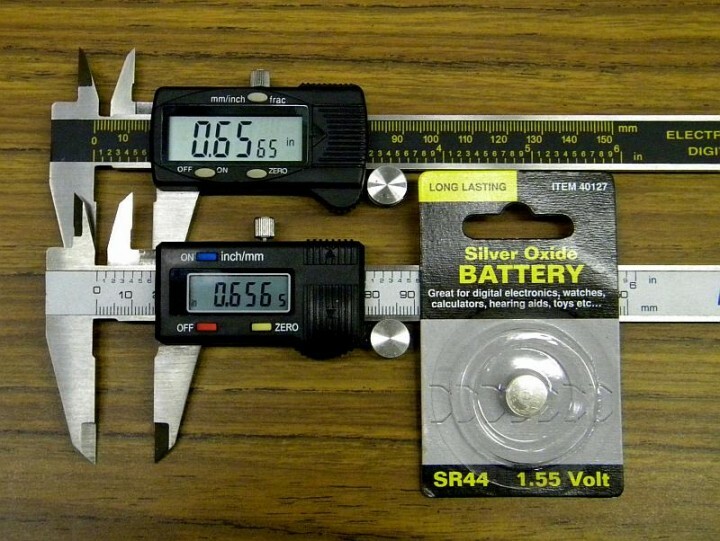 The SR44s are silver oxide batteries and they produce a higher voltage and store more energy. So they’ll last a lot longer before their voltage drops below what your caliper needs to operate. I haven’t tried any name brand SR44 batteries yet so I don’t know what they cost or if they’re much better than the ones HF sells for 99 cents. You can either buy the cheap LR44s and constantly change your batteries, or you can buy the more expensive SR44s and change them maybe once or twice a year. I’ve never had a chance to use an expensive digital caliper so I can’t compare my HF calipers to one. I’d love to know your opinion if you’ve used both, or if you have other knowledge about digital calipers that you would be willing to share with us. I don’t have a HF branded one, but I do have the expensive 8″ Mitutoyo – which I bought for work at least 20 years ago. The good one gets a lot of use, and it has never let me down. It’s pretty good on batteries as well; I think it’s been replaced less than half a dozen times in all those years. I do have a cheapie that I got from eBay (~$10), and it’s absolutely crap. Not even a look alike like the HF ones, it’s smooth and painted silver. Came with a dead battery, too. It’s relegated to marking out and other abusive tasks. From other good sources I have read that you should not use the thumb wheel. It is recommended that you grasp the blades between thumb and forefinger and bring them together to the material being measured, and that a tight grip is not good as it can give a false reading smaller than actual. I’ve used both Mitutoyo’s and various cheap digital calipers. Aside from better full scale accuracy, the Mitutoyo’s allow much smoother adjustment than the cheap ones, which feel “sticky” to me. That being said, a Mitutoyo is crap if you do not follow good measurement processes. The tutorial said nothing about keeping the calipers perpendicular to the measured surface (seems obvious, but I’ve seen so many make this mistake). The accuracy/precision of a well-calibrated set of calipers can be misleading if the user biases measurements with poor hand postures. Even with the utmost care, the achievable precision with calipers can be lower than many people expect. Averaging repeat measurements and looking at the spread is a good way to gain intuition about caliper-based measurement processes.